It is the end of April, right? Because as of right now it is snowing outside. Last week we had 15 inches and now are being hit again with a milder storm. So, originally I was going to save this post for next fall when it may be more practical, but hey- winter is apparently not over in Colorado and so just in case it is the same where you live, check out the mitten/sock combo I like to call the smitten. I wish I could say this idea was mine, but it was my husband's cousin's wife's idea...did you follow that? This summer we were talking about the annoyance of kids' gloves and how they get snow up their sleeve which makes them cold and whiny and she asked if I could sew socks on some mittens. I looked at her and thought- genius...why didn't I think of that. Then of course the name smitten...a glove you can love, came into my head...so one day, if you see these go BIG, you will know all my dreams came true. Well, not really, because I am about to tell you how you can make them. Enjoy. First, you will need a pair of gloves or mittens (I bought these on clearance at Walmart for a $1 or $2, they also came with a hat). Then find a pair of children's socks that are close to knee length. I found a combo pack on clearance at Walmart as well. Grab some scissors, pins, and your machine. Cut off the foot portion of the sock. If you are some scrap busting master, I am sure you can find something to do with the foot portion. I tossed em...way too much stuff in this lady's craft room already! 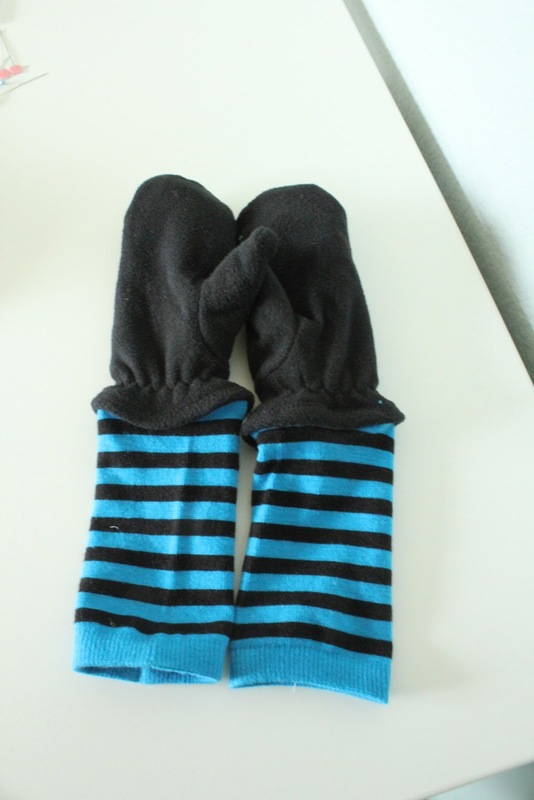 Turn both the sock and the mitten inside out. 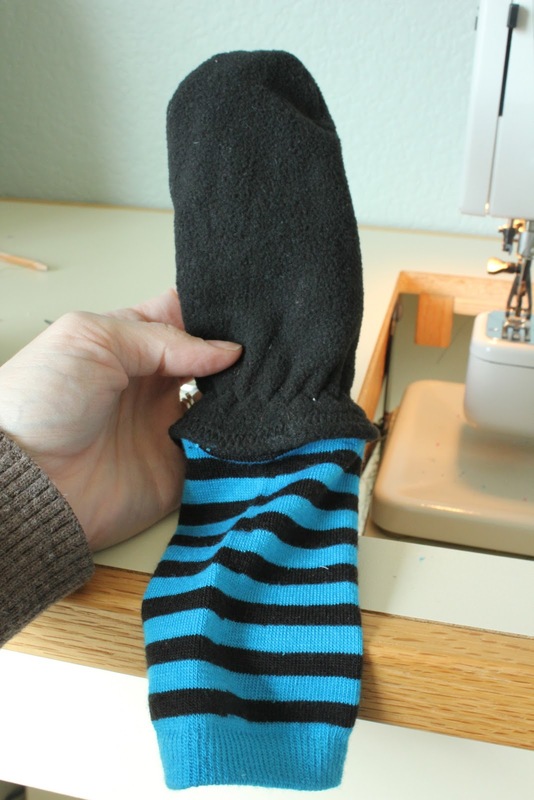 Slide the sock over the mitten and pin. (This part is kind of hard to explain...I just wiggled the sock around until it was even with the bottom elastic edge of the mitten. You will have to reach your hand inside and fiddle with it a bit). Set your machine to a wide zig-zag stitch. You need to have a free arm machine so that you can release the base and have a narrower arm. Slide your sock onto the arm until you reach the point the sock and mitten meet. Begin stitching all the way around. It is a tight fit and you can see above I am kind of having to push my fabric where I want it. Just go slow and keep adjusting the sock/mitten. Make sure your needle is DOWN in the fabric before you adjust the fabric. Then snip the thread, and turn right side out- and that's it! My kiddos used them for the first time last week and they worked great...even better, my 2 year old couldn't take them off on his own so they stayed put until I wanted them off. Which is nice if you have a kid who constantly tries to take mittens off while out in the cold! that's a great idea. I don't have a sewing machine, do you think it would be a pain to hand stitch it? All hand stitching is a pain...haha...clearly I am not a fan but that is because I am bad at it. I actually don't think it would be that bad, it would just be making sure there was stretch to your stitch (zig zag) that may be the challenge- hope that helps! Awesome idea! I will remember I saw it here when your idea goes viral!!! Awesome idea! I will remember I saw it here when your husband's cousin's wife (haha!) came up with the idea! !